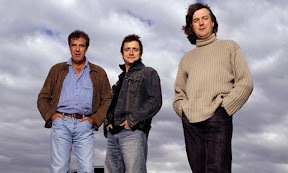 Yup, Top Gear is back in full force, finally. At some point last year, it seemed like the show would only return in February. This would mean missing the usual Christmas shows which then runs into January. Then the great BBC decided to stuff in two episodes to plug that gap with the US special and that mad Bethlehem episode. At this point, I just hope the Beeb won't start playing tricks with it's scheduling again. I mean. It has four full fledged channels. If they were able to sort it out during the Football World Cup last year, I'm sure they could do something to avoid a clash with snooker. Why? Well, no matter how stupid the topics covered appears, and how irrelevant everything on that show is, it's fantastic entertainment for a Sunday night. I've been waiting for the Ariel Atom V8 to be featured on the show, and happily, it was tonight. I saw the car in action on Jezza's Christmas DVD but it wasn't quite the same as a full blown power test on TG. It was always going to blow everything out of the Power Board at 500 BHP haling just half a tonne around. But the surprise came in the form of John Bishop as the Star in a Reasonably Priced Car. I've been following him for some time, since he became a bit well known. He sits in quite a lot on panel shows on the Beeb. Unfortunately, I don't always understand what he is saying. His Liverpudlian accent is often beyond my capabilities unless I listen intently or watch it a second time. But whatever I do get out of it, he's really funny. So this bloke who speaks nearly foreign comes onto my staple show and does his lap. It looked amazingly smooth, and pretty quick. After seeing Tom Cruise blitz the lap last year, I just can't believe anyone would go quicker. Well, Mr Bishop plonked in a 1:42.8, nearly 2 seconds faster than the Top Gun star. What a real bombshell that was. Good man!